Hillary Clinton and Bernie Sanders each entered the first Democratic debate with different goals, and both accomplished them. Clinton was more polished, with both more debating experience, and having prepared in a conventional manner. She was also better at evading questions she did not want to answer. She won the chattering class. The same journalists who have underestimated Sanders from the start, and have not taken his campaign seriously, say that Clinton won. Bernie Sanders by all objective measures won the debate. Hands down. I don’t say this as a personal analysis of the debate – the very idea of “winning” a debate is silly to me. I say this because based on the only objective metrics we have, online polls and focus groups, he did win. And it’s not even close. Sanders won the CNN focus group, the Fusion focus group, and the Fox News focus group – in the latter, he even converted several Hillary supporters. He won the Slate online poll, the CNN/Time online poll, 9News Colorado, The Street online poll, Fox5 poll, the conservative Drudge online poll and the liberal Daily Kos online poll. There wasn’t, to this writer’s knowledge, a poll he didn’t win by at least an 18 point margin. But you wouldn’t know this from reading the establishment press. The New York Times, The New Yorker, CNN, Politico, Slate, New York Magazine, and Vox all of which unanimously say Hillary Clinton cleaned house. Sanders went into the debate with an unconventional preparation as I discussed last week. Sanders did not go into the debate memorizing zingers or planning to try to take down Hillary Clinton. He used the debate to get access to potential voters who were not aware of him, and succeeded. This is also seen in the number of Google searches for him. To some degree this could be the novelty factor, from people who already knew about Clinton but not Sanders, but the large number of people expressing interest is bound to translate into some new supporters. While Clinton did receive far more favorable reviews from the mainstream media, there are exceptions. Philip Bump at The Washington Post did point out how Sanders was the candidate breaking through. The Chicago Tribune considered Sanders to be the winner. Russell Berman at The Atlantic argued that Sanders might receive a bigger bounce from the debate than Clinton. As might be expected, many blogs on the left also felt that Sanders won the debate. Sanders could have also done a better job on guns, but he did note his D- lifetime rating from the NRA (with Sanders also receiving an F at least once). While some Democrats will attack his record, I believe that Sanders’ approach of considering both the need for gun control and the rights of hunters to be a stronger position for a general election. Sanders would also be in a stronger position than Clinton to bring both sides to the table to work on sensible gun legislation. Sanders was more prepared for the questions about Black Lives Matter. Note that Sanders repeated the phrase, but Clinton did not. Sanders wins a point over Clinton in his support for expanding Social Security. In contrast to the Republicans, it was good to see a political party which faced reality on climate change, but there are also aspects of Clinton’s environmental record which could have been challenged. Sanders was right in arguing that war should only be considered as a last resort. Clinton was unable to defend her mistakes on Libya or Syria, but her opponents could also have done a better job of criticizing her on these. Perhaps it would have been different if Joe Biden was there, considering how he spent four years opposing Clinton’s hawkish views. Sanders was also far better than Clinton when discussing civil liberties, including his opposition to NSA surveillance, and marijuana laws, including opposition to the drug war. Despite calling himself a Democratic Socialist, in many ways Sanders is the most libertarian candidate running from either party (at least for us left-libertarians who concentrate on civil liberties as opposed to greater freedom for giant corporations). Clinton revised her earlier position on the Trans-Pacific Partnership, a proposed trade agreement between 12 Pacific Rim countries, claiming that she merely said she “hoped” it would be a “gold standard.” But her earlier support was more unequivocal. The topic arose when debate moderator Anderson Cooper asked Clinton if some of her recent position changes were tied to political expediency, and he specifically referenced Clinton’s recent decision to oppose the TPP. But Clinton didn’t add the “hoped it would be” qualifier when she made the initial comment about the TPP in 2012. Two days later, in Singapore, Clinton again sang the praises of the TPP. When asked about her unusual email arrangement as secretary of state, Clinton said, “What I did was allowed by the State Department.” That’s not the full story. Clinton conducted government business exclusively using a personal email account (hdr22@clintonemail.com), and those emails were stored on a private server. As we have written before, the State Department and the Clinton campaign have cited a National Archives and Records Administration rule issued in 2009 that said federal agencies that allow the use of personal emails must preserve them “in the appropriate agency recordkeeping system.” So personal emails were allowed. But federal rules also required Clinton to preserve her work emails “at the end of the Secretary’s tenure or sooner if necessary.” She did not turn over copies of her emails to the State Department until Dec. 5, 2014 — nearly two years after she left office on Feb. 1, 2013. Also, whether the State Department allowed it or not, Clinton’s decision “to conduct all e-mail correspondence through a private e-mail network, using a non-.gov address, is inconsistent with long-established policies and practices under the Federal Records Act and NARA regulations governing all federal agencies,” according to congressional testimony of Jason R. Baron, a former director of litigation at the National Archives, who is now a lawyer at Drinker Biddle. Sanders’ biggest error was to present statistics for underemployment when making statements about unemployment, and got the ranking of the United States in income inequality wrong. Sanders did provide an unexpected lifeline to Clinton when the email scandal came up, objecting to discussing this instead of the issues. It makes sense that he would not want to include this in his campaign, especially at a Democratic debate in front of partisan Democrats invited by the DNC. Besides, if Sanders had his way, he would talk about nothing other than income inequality and related economic matters throughout the debate, and the campaign. It is also unnecessary for Sanders to discuss this when there are still around thirty-six FOIA suits in progress along with the Justice Department investigation. If this was a debate in the general election, the Republicans could have raised a lot of valid points against Clinton, and this time would not have had to make things up as with Benghazi. As The Washington Post noted, the email scandal is not a problem which is going away. Sanders can sit back and let it all play out. While both Clinton and Sanders could claim victories in this debate, the night did not go as well for the other candidates. I thought Martin O’Malley often did a fine job, including setting Clinton straight on economic policy at one point, but so far there are no signs he is receiving credit for this. He has shown he could make a fine cabinet member, but it is hard to see him becoming a viable candidate for the nomination this year. I give Lincoln Chafee credit for taking on Clinton over both her support for the Iraq war and over ethics. While he has no chance at becoming president, probably not now or ever, I do hope he remains around in politics, and perhaps in the next administration, to provide a conscience. Unfortunately he will be most remembered for being unprepared for his first vote as a Senator. Jim Webb blew any chance of using this debate to improve his campaign, and probably will only be remembered for having said he killed somebody. Donald Trump also tried to get in on the action by live-blogging the debate, but he seemed totally over his head when issues came up. 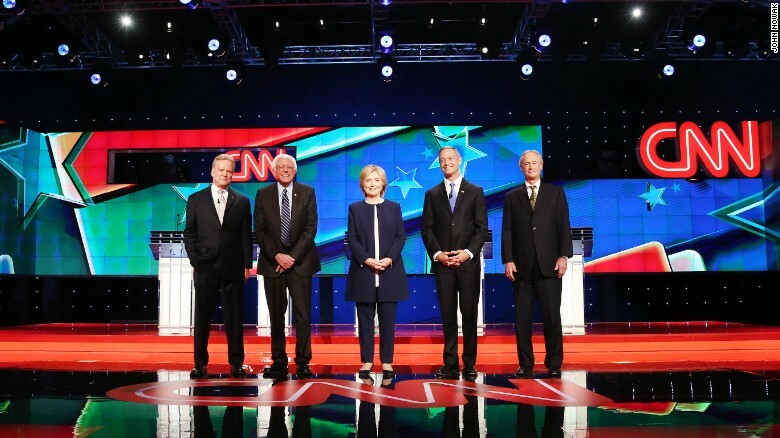 Once again, the Democrats showed they were far superior to the Republican candidates.